In 2004 the United Nations Security Council initiated a “Working Group on General Issues of Sanctions” in order to increase the Council’s effectiveness in terms of sanctions implementation. With this reform, the Council reacted to the harsh criticism from the UN against the conventional sanctions practice. It was the Security Council’s latest endeavor to make ratified sanctions more punitive, coercive, and thus effective as far as causing compliance within its judicial framework is concerned. Summarized under the term “smart sanctions”, the Security Council tries to be more accurate in addressing sanctions thereby seeking not only to increase political effectiveness, but also to reduce unintended humanitarian suffering. While conventional sanctions are comprehensive and comprised of a variety of measures, such as trade boycotts and embargoes against the entire country, smart or targeted sanctions (as they are also termed) are selective, targeting only at certain areas or individuals. Consequently, sanctions are the practical expression of the Council’s sovereignty. The Council “lives and breathes” through the ratification of sanctions, so their corroboration and proper enforcement reflect the organization’s vitality. In short, if sanctions fail, the Council fails. How do member states contribute to the ratification and enforcement of smart sanctions? 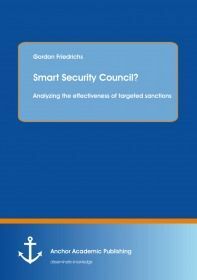 Has the use of smart sanctions increased the effectiveness of the UNSC as a sanctioning body? The concept of input/output legitimacy serves as a model for analyzing the member states’ commitment and will to impose smart sanctions, thus developing an alternative understanding of the term “effectiveness”. As the cases of Iran and North-Korea reveal, the ratification and enforcement of smart sanctions suffer legitimacy. This has ramifications both theoretically and empirically as it makes the concept of legitimacy a valuable tool for policy makers and reformists while simultaneously exposing substantial weaknesses of the new sanction practice.